When you think of Colorado Springs, you may think of the Garden of the Gods, Pikes Peak or the US Air Force Academy. 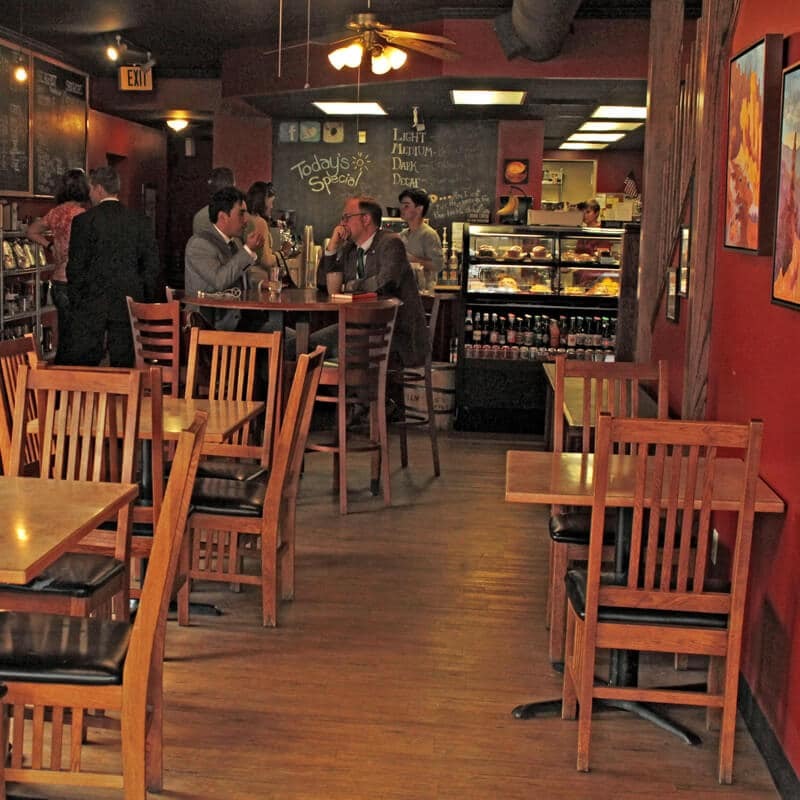 And while those are all worthwhile attractions in our fair city, located right in the heart of the city, we pride ourselves on being not only a local coffee house, but kind of an institution as well. 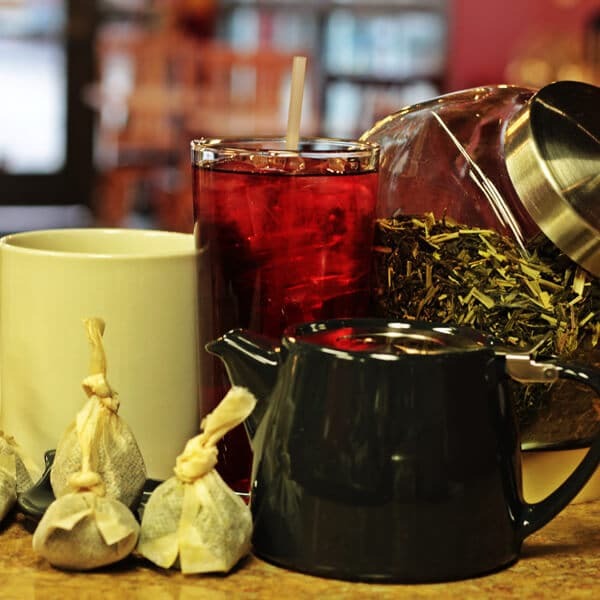 Offering a great deal more than coffee, our menu extends to give locals and visitors alike an amazing selection of loose leaf teas, fresh fruit smoothies, sandwiches and desserts. Sit down and stay a spell, and enjoy our complimentary wi-fi for a bit, too. Whether you’re on your way to the office, stopping in between classes or just visiting our little corner of the world, we invite you in any day of the week. In fact, take a look at the specials we offer on any given day. While it may be hard for some people to imagine, not everyone loves the java quite as much as we do, and we understand this. With this in mind, we also carry the finest loose leaf teas you’ve ever tried. Tea drinkers deserve the best, just as the coffee drinkers do, and that’s why we buy the best loose leaf tea on the market, “Harney & Sons”. A family owned and managed tea company with three generations of Harney’s keeping up the tradition of fine teas, the family travels the world in search of the finest ingredients. Here at The Perk, each cup of tea is hand scooped into a custom tea bag, creating a taste experience like you’ve never had before. If you’re like most people who come into The Perk Downtown, you want a little somethin’-somethin’ to go with your coffee or tea. 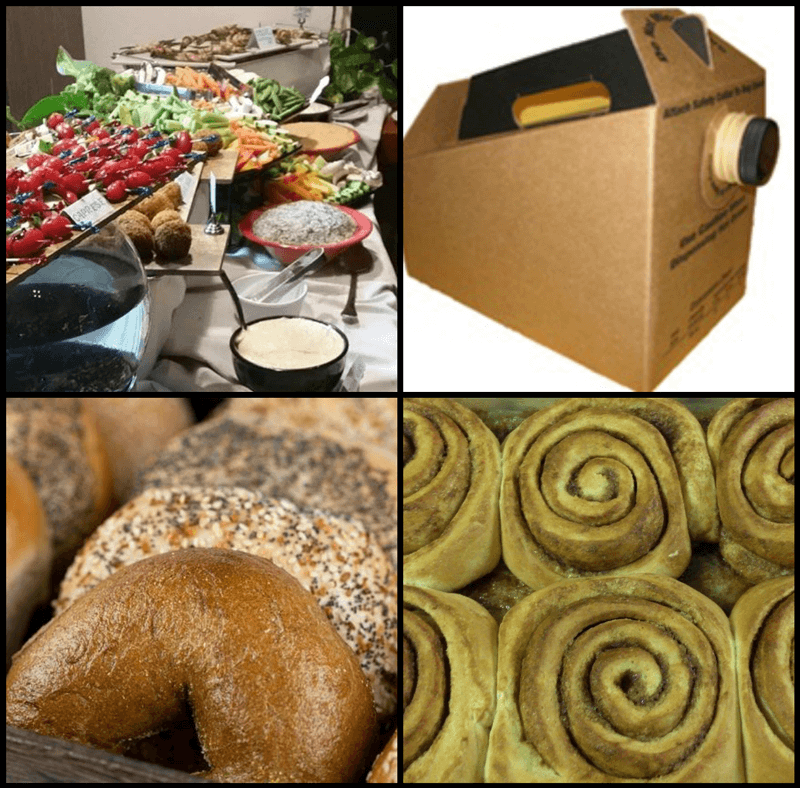 So, we have what we term the 4-B’s…Baked goods, Breads, Bagels and Breakfast items ready for you to pair with your drink of choice. Not talking bad about the other guys in the area, but you’ll never find us buying or serving frozen goods from those national chains. No, whenever possible, we scout out and find local bakers from which to buy. 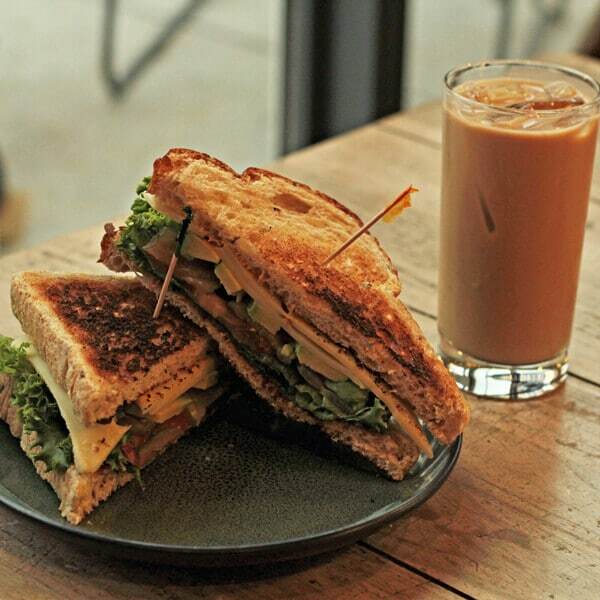 We love some good food, so serving delectable, fresh from the oven goods is our goal. It is our goal to become 100% local and “as close” to 100% Organic as we can get. It’s a tall order, but our customers deserve that quality. Look for our locally made artisan bread, amazing Old World bagels, hand-made burritos, scrumptious baked goods (ask about our many gluten-free items!) from Bella’s Bakery or our 100% organic “sourdough” cinnamon rolls from The Sourdough Boulangerie. Let’s put it this way, if you leave hungry, it’s your own fault. As a tea drinker, you deserve THE BEST, and that is the only option for us as well. That is why we buy the BEST loose leaf tea on the market, “Harney & Sons”. This tea company remains family owned and managed, with three generations of Harney’s preserving the tradition of fine tea and traveling the world in search of the finest ingredients. At The Perk, each tea is hand scooped into your very own custom tea bag! We will create a taste experience for you! This is where we really shine! A few years ago, we purchased our own roasting house so that we could have more control over the quality of the coffee beans we bought. 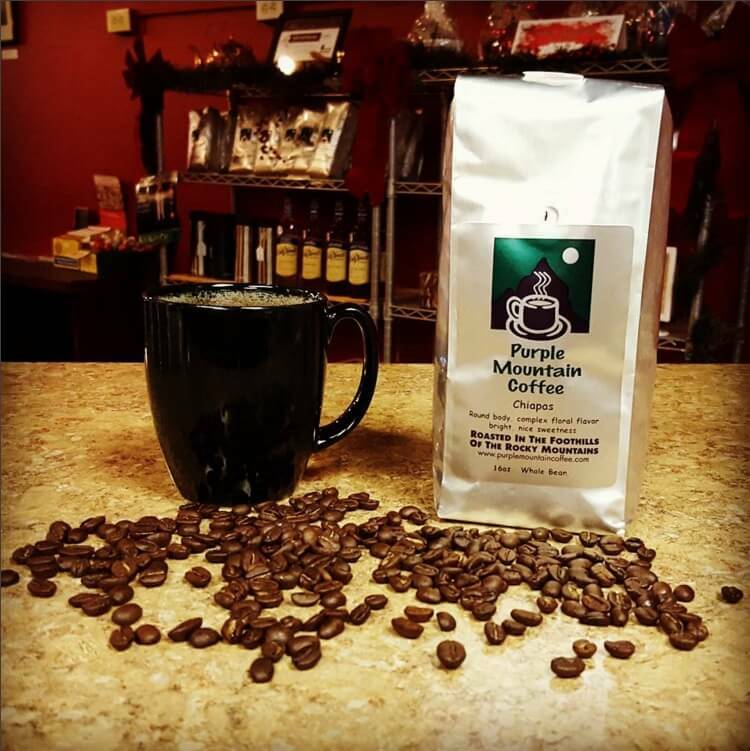 With the purchase of Purple Mountain Coffee, we also got Abigail Kreuser. “Abby” is one of the most seasoned roasters in Colorado Springs and has been honing her craft for over 18 years! Her work on our San Franciscan Roaster is a labor of love and it shows in each cup of our coffee. Baked Goods, Breads, Bagels and Breakfast Items. That’s a lot of B’s but we have a lot to offer! Our foods are delectable and fresh from the oven in most cases. Whether it is our artisan bread, amazing bagels, our hand made burritos, our amazing baked good’s (many are gluten free) from Bella’s Bakery or our amazing 100% Organic sourdough cinnamon rolls from The Sourdough Boulangerie, you will be greatly pleased and satisfied when you eat with us! Locally Brewed Beers, Classic Wines and Signature Cocktails Our Alcohol Selection is new, fresh and growing every week with new additions and offerings! Our goal is to offer a variety of options outside of our great coffee. Coming in late and don’t want the caffeine? Looking for a quiet place to sit with friends and enjoy a bottle of wine or a couple beers? You could also try on of our Signature Cocktails from our every changing and seasonal choices. This Happy Hour changes all the time with amazing deals! Stop in or call for our current offerings! for the price of a medium. Get one at a discount! Our Signature Spicy Bloody Maries and Mimosas are 1/2 Price ALL DAY LONG! All prices do not include tax and are subject to change due to availability of the product. While some people stop in daily for their cup of Joe, still others look for our special gatherings and events from backyard farmer Meet and Greets to Free B-Movie showings; it seems like we’ve always got something going on around here. We try to keep everyone informed about what’s going on, but if you’re interested, just ask. It may be a showing of The Night of the Living Dead (or something equally as zombiesque) or our monthly gaming nights. Sometimes, we even have money seminars or we get light-hearted and feature a comedy improv. You really just never know what we’ll come up with. And, if you’re interested in playing at The Perk, Contact us Today!! All events are held at The Perk Downtown unless specifically specified and may be rescheduled or canceled due to inclement weather conditions. For any questions, please call our staff at (719) 635-1600. Interested in playing at The Perk? Contact us Today!! So, what should you expect from us? First of all, we have great hours, open early morning until late nights. We have friendly faces ready to serve you, and comfortable spots to kick back and enjoy your cup and snack, breakfast or lunch. So whether we’re your end destination, a waiting spot to meet up with your friends or for the restaurant with the hour wait to finally call your name, you’re always welcome at our place. What most people don’t know about us is that we actually own our very own roasting house. Located just a few blocks west of us in the Art District, we find we’re able to carry our own line of locally roasted Fair Trade Coffees. Why would we do such a thing? By owning our own roasting house, we found we could have more control over the quality of the coffee beans we bought, and quality has always been our number one goal. On top of that, we also employ one of the best coffee roasters in all of Colorado, Abigail Krueser. Yes, Abby has been roasting coffee with us for going on 20 years and not to brag or anything, but we happen to think she’s amazing. Her personal care shows in each and every cup. But one employee doesn’t make us the best, but the rest of our employees sure do. At The Perk Downtown, we take it very seriously only to hire the very best employees and then, we train them our way, making them even better. Our baristas love what they do and it really shows in their service. If you ever thought the age of good customer service was dead and gone, think again. 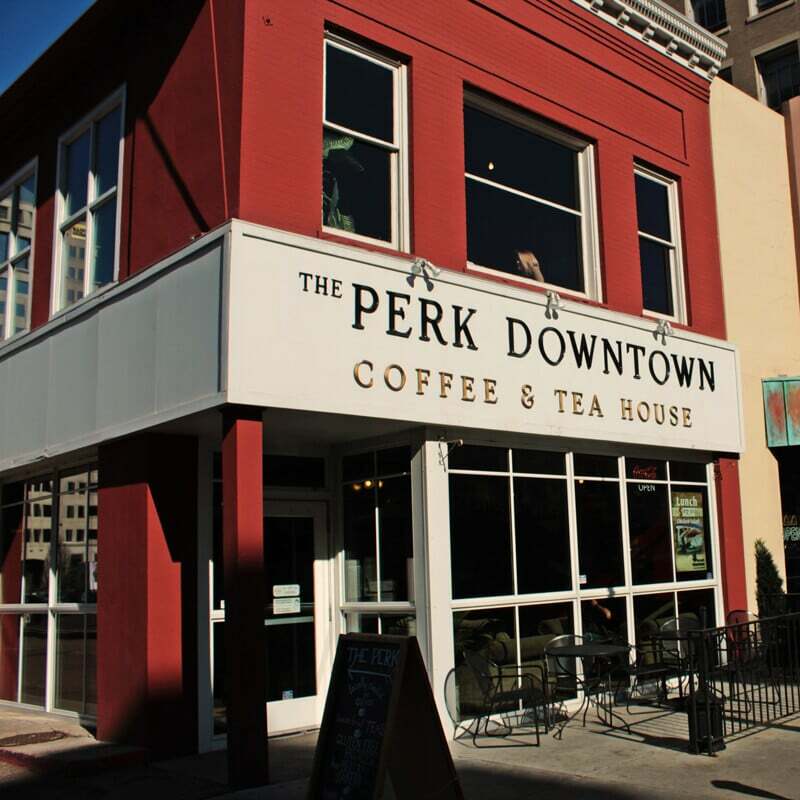 At The Perk Downtown, our employees are driven, giving the best possible customer service. After a repeat visit, they do their best to remember your name, and don’t be surprised when they know what you want to order, too. We’ve built a business here of employees, yes, but more than that…a family consisting of valuable, loving members who each contribute to greater good and enjoy what they do. JUST WHERE ARE YOU LOCATED???? Now that you know exactly what to expect and you’re chomping at the bit to give us a try, it’d help to know just where we’re located. We are easy to find in beautiful Downtown Colorado Springs, in a sunny historical building, close to several businesses, shops and other local destinations. WHO MIGHT I RUN INTO THERE? 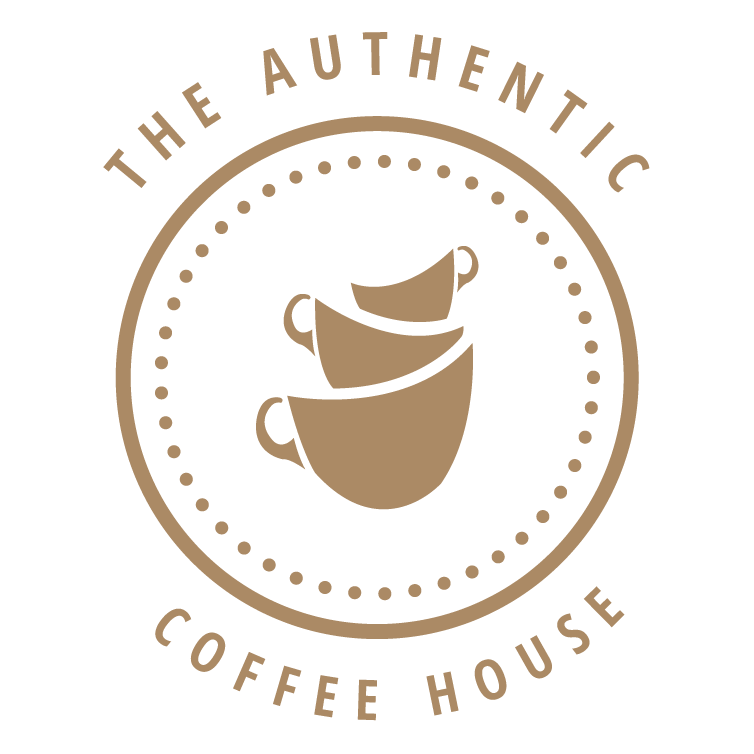 If you think we’re one of those snooty coffee shops, or one of the run-of-the mill national chains you could find anywhere, you will change your mind when you walk through the door. Located in the heart of our great city, and right on the main drag through our beautiful downtown, we serve a wide demographic of people from the area. You’ll see business professionals, students from the nearby Colorado College, downtown shoppers, and neighborhood residents just dropping in for a cup. Some may be on the run to their next business deal and some may be relaxing and just want to kick back with a book or their laptop. Either way is fine with us, there’s plenty to eat and drink and the wi-fi is complementary. If you’d like to make that family reunion, bachelorette party or baby shower even more special, listen to this. 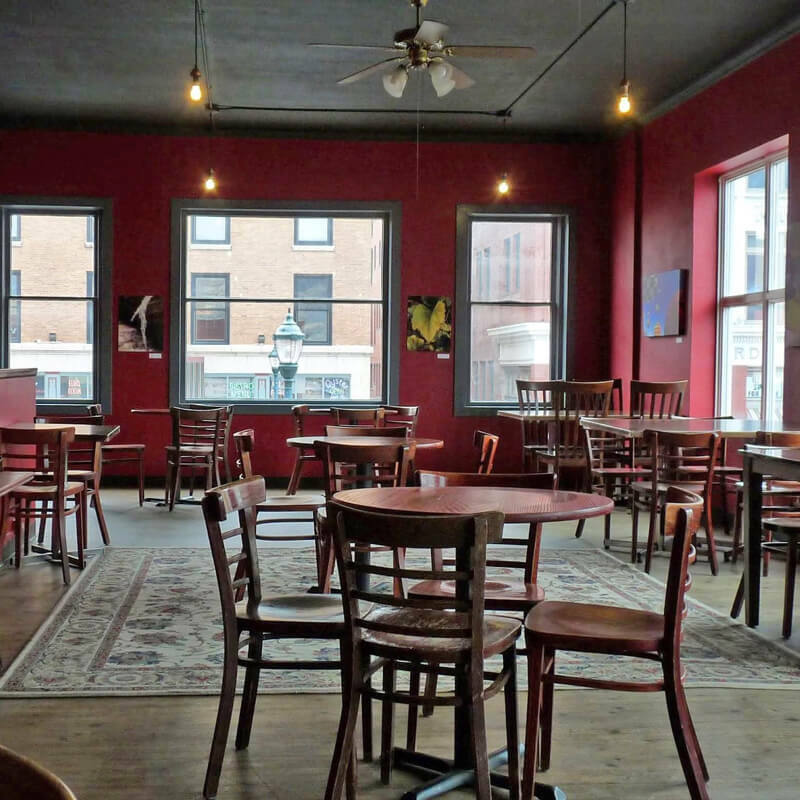 The Perk Downtown rents out its entire upper level for special events and gatherings. With plenty of room for everyone. The space upstairs rents for $65/hour with a $100 refundable damage deposit. Please be aware your date and time selections made on this form do not automatically reserve your spot. If you are unsure, please give your best guess. Cater Your Next Meeting with Amazing Food & Drink. You had to know that with coffee, tea and baked goods as great as we say they are, we had to offer catering didn’t you? Well, we do. If you’re hosting a meeting at the office, have out of town guests you want to impress (and trust me, with our goods, you will) or just want Christmas morning to be extra special, give us a call and get a price quote or find out what type of trays we can provide. We’ll provide all the goods to make your event extra special and make you look good in the process. With hundreds of events to our credit, we have the experience, staff and kitchen to do up events from half a dozen to a hundred or more. Our catering menu is available for corporate and social events. We have included a variety of items, but would be happy to create a menu just for your event. Please give an estimated number of people that will be served.